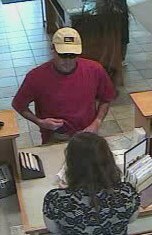 These are surveillance photos of a man who robbed the US Bank at 2448 F Rd just after 10:30 this morning. 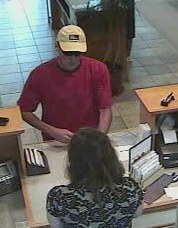 He walked into the bank and up to a teller, showed her a note demanding money and indicated he had a weapon. The suspect then ran out of the bank and was last seen heading north on foot. There were 5 employees and 2 customers in the store at the time of the robbery. No one was injured. Caprock Academy was placed on lockdown for a short time while we searched the area for the suspect. The suspect is described as a white man, approximately 5-feet 10-inches tall, with a thin build, wearing a red shirt, khaki hat with an unknown logo on it, dark sunglasses, and tan pants or shorts. He has short brown hair. If anyone has information about this suspect they can call the Grand Junction Police Department at 242-6707, call Crime Stoppers at 241-STOP, send the information via the web at www.241stop.com, or text CRIMES to 241STOP and include your tip information. The identity of the person providing the information will remain anonymous.